You are a Dragon. Like all respectable dragons you must find yourself a Princess and horde some treasure. There are some nearby towns just ripe for the plunder. 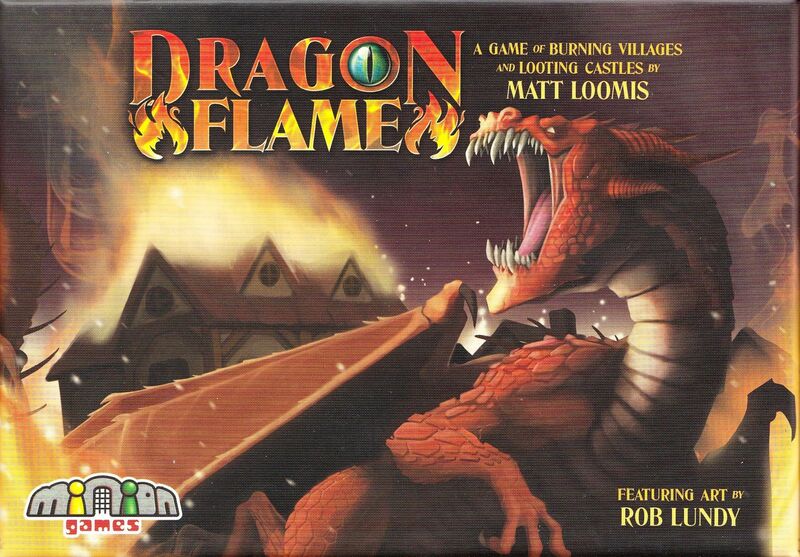 You must strafe these villages with your dragonflame until they submit and hand over their treasures. But of course, you're not the only Dragon out there! In DragonFlame you will take turns placing 3 cards on to the Castle cards in the center of the table. This will create piles of cards that you will get to choose from at the end of the round. The pile you choose will also determine your turn order for the next round. Once you've taken a pile you place the cards in front of you for end game scoring. Any DragonFire cards you have acquired give you the ability to flame the villages for a area-control over these cards (more victory points). Since sometimes you may place a card face down, this becomes a game of reading the other players and choosing the right (sometimes poisoned) piles. Do you take that pile with a lot of cards and risk the minus points or just go for the safe face up treasures? There are several types of treasures to collect. You will only score 1 of the types of chests and the others count against you. Some treasures are just straight forward points. Some are even powerful magic items with special abilities.